Perhaps the most common association with Scandinavian style is minimalist decor. Less is more when it comes to decorating, and the concept of "slow design" focuses on fewer, higher quality pieces collected over time. Scandinavian style incorporates materials that meld indoors with outdoors - natural woods, slat walls, leather accents and greenery. "Cottage culture" architecture style draws on these influences and makes interiors feel like cozy cabins in the woods. Another key aspect of the Nordic style is hardworking, functional furnishings. A piece can be beautiful and also have utility - like eye-catching shoe racks and shelving, or built-in bed storage that creates a unique frame. Scandinavian style incorporates natural tones of whites, grays and light browns. Pale wood and whitewashed floors create a clean, spacious look. That look can be achieved with oak and maple styles, as well as wood-look tiles and laminates with wood graining. 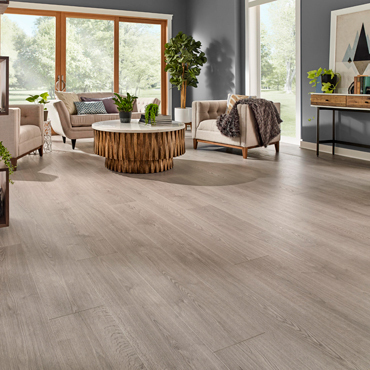 Retailers like Lumber Liquidators, who regularly publish seasonal trends reports, have an array of cool-toned flooring options to choose from, such as Dream Home X2O Misty Morning Oak, a water-resistant laminate with a soft seashell tone and realistic oak graining.